After you have create a friends list for Facebook Chat, and populated it by adding friends to the list, it offers a convenient way of chatting with a select group of people, and especially useful to appear online to only some people amongst all your Facebook friends. 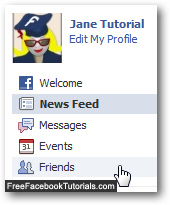 But if you no longer need a particular friends list, and want to save some space inside the mini Facebook Chat client, you can quite easily permanently delete a friends list, as you'll learn in this tutorial. And, before we actually show you how to do that, note that there are a couple options you could choose instead: the first is to rename the friends list, if its name was the problem; the second is to temporarily hide the friends list in question, which gives you the choice of reactivating it and showing it back on the chat client at a later stage. Facebook will now display a "Delete [friends list name]?" confirmation message: "Are you sure you want to delete this list? This operation cannot be undone". In other words, you cannot undelete a friends list from Facebook Chat after the fact. To proceed and permanently delete the selected friends list, click on the "Confirm" button. Within a few seconds, Facebook will delete the friends list from Chat, and bring you back to the "Friends" list from where we came; notice that the friends list you just deleted no longer appears in the left hand side of the screen - this is your visual confirmation that it was removed. Since you can't undo the deletion of a Facebook Chat friends list, you can instead re-create the friends list later on, and add back to it some friends, if you do decide that you need it after all!